Pro Pants, now in its second year, is a counter-movement to Improv Everywhere‘s annual No Pants! Subway Ride. 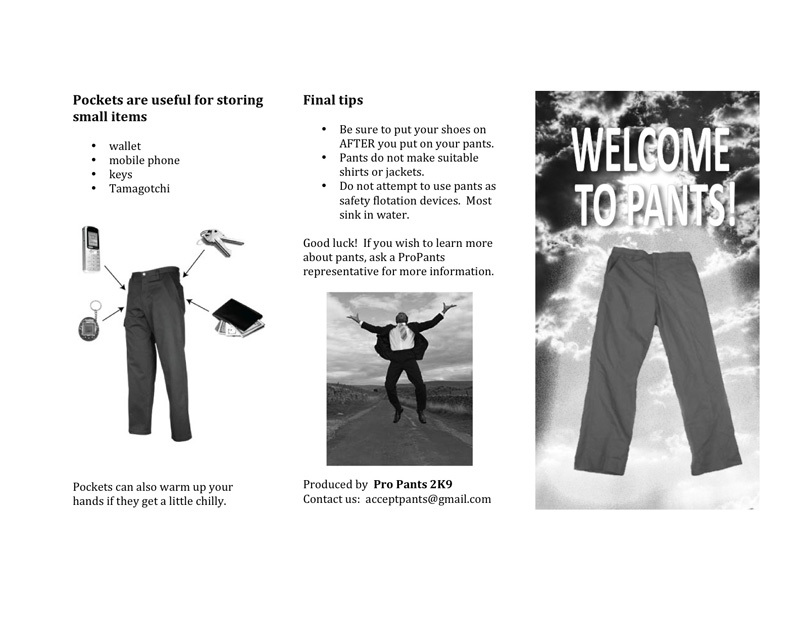 The Pro Pants mission is to inform pantsless riders about the joys and advantages of pants and to persuade them to accept pants into their lives. 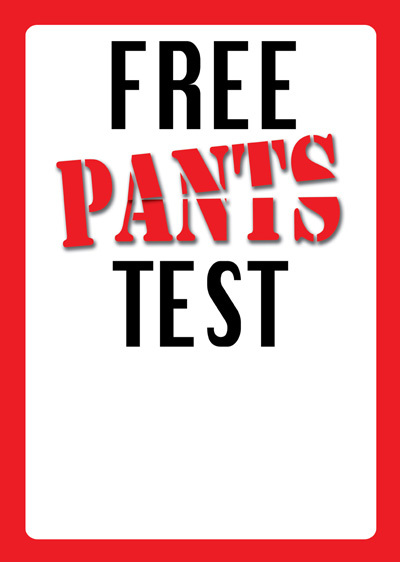 The campaign’s methods are highly effective: an estimated 100% of pantsless people enter a long-term pants-full lifestyle within 24 hours of encountering a Pro Pants representative. 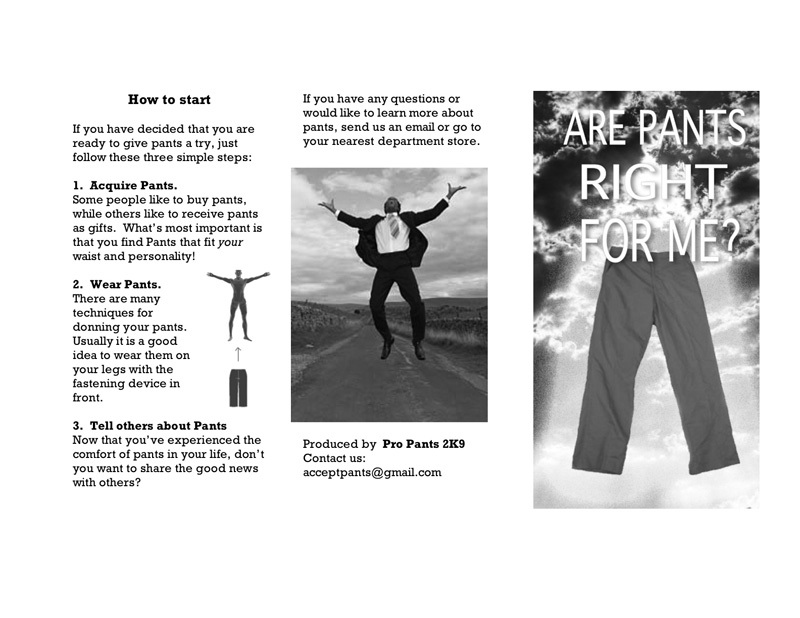 While Pro Pants 2K8 achieved a perfect conversion rate, the Pro Pants movement shifted its approach for 2009 to create more opportunities for introspection and to minimize confrontational rhetoric. Knowing the No Pants! Subway Ride would finish at Union Square, Pro Pants representatives set up Free Pants Tests stations in the park to greet the pantsless riders as they emerged from the subway station. 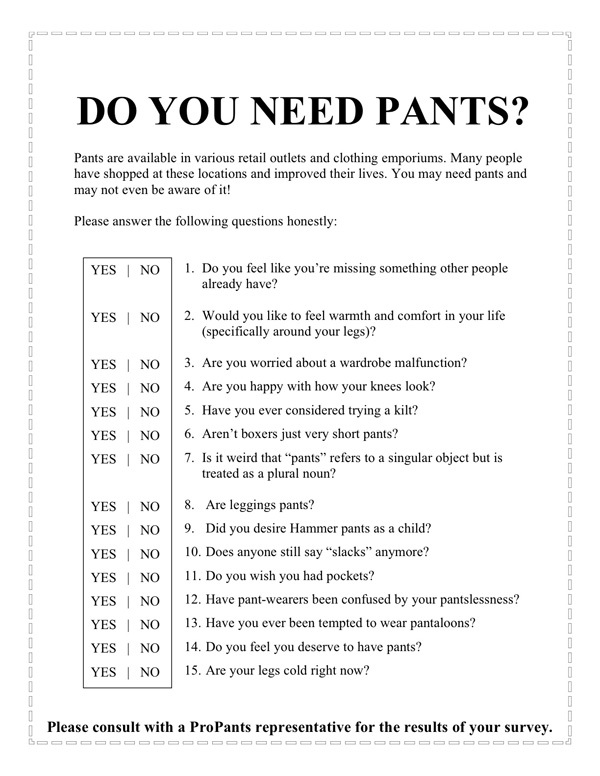 Those not wearing pants were politely asked if they would be interested in completing a one-page questionnaire entitled “Do You Need Pants?” which was promptly graded by a Pro Pants representative. If it was determined the pantsless questionnaire-taker needed pants (they always did, of course) they were given some literature and if interested, measured and fitted with their first pair of pants. Despite the snowstorm, Pro Pants representatives issued 200 questionnaires, distributed over 400 pamphlets, and gave away more than 20 pairs of pants! And within 24 hours, roughly 100% of the pantsless riders had accepted pants into their lives! Inquiring pantsless persons were asked to fill out this short questionnaire. 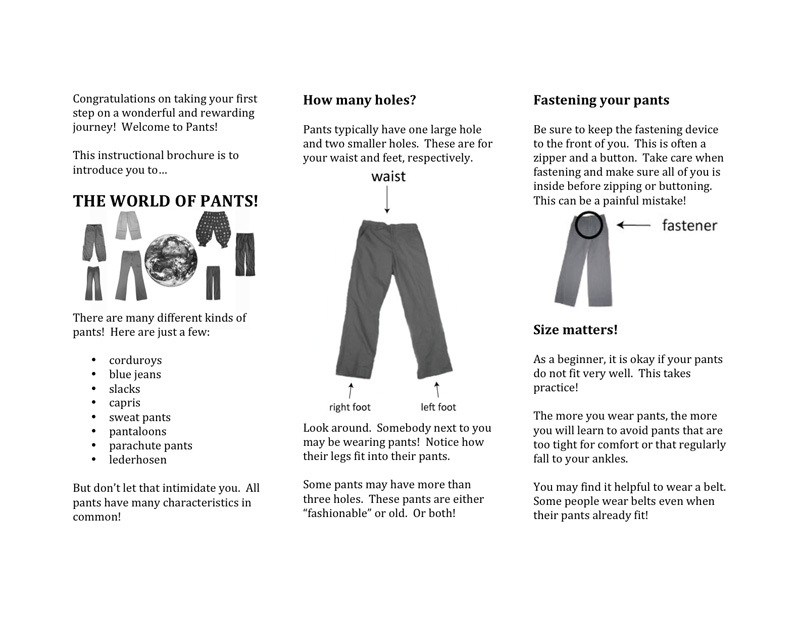 An introduction to the World of Pants, including instructions and tips for proper usage.